Participants repeated "Gambaro!" three times at the 5.15 rally and called for the blocking of the new base on the Sedake Beach, Nago, on May 14. On May 15, Okinawa reached the milestone of 45 years of reversion to Japan from U.S. occupation. Okinawans have aspired to make their islands free of military bases, but have still not realized their dream. The Japanese government is forcibly constructing a new base in Henoko, Nago, as a part of the relocation of U.S. Marine Corps Air Station Futenma in Ginowan. 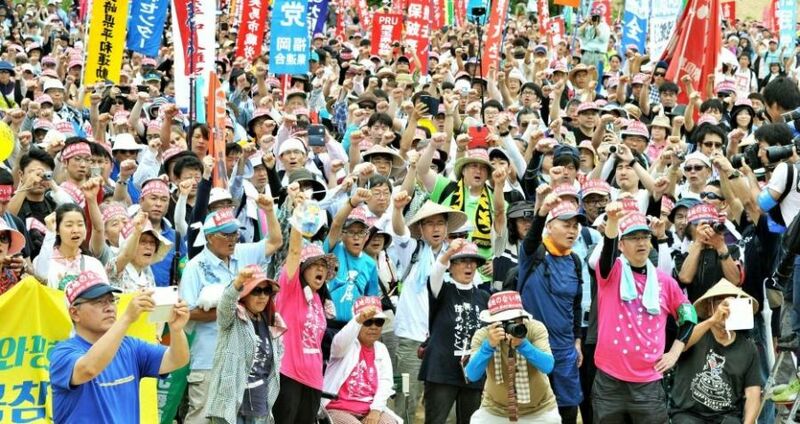 On May 14, the day before marking the 45th anniversary of reversion, on the beach of Sedake, Nago, from where protesters can see the construction site, the 5.1 Peace March Execution Committee and the Okinawa Peace Movement Center held a rally. According to the organizers, about 2,200 people took part, holding up their fists in protest against the construction of the new base. The rally participants adopted a declaration expressing strong opposition to the strengthening and expansion of the U.S. military and Japanese Self-Defence Forces (SDF)’ bases promoted by the governments of Japan and the United States. It referred to the SDF’s unit deployment to Miyako and Yaeyama. Participants marched about two kilometers to the Wansaka Oura Park and repeated “Gambaro!” three times at the end.